In routine clinical practice, the serum creatinine (SCr) has been the most commonly used parameter to evaluate kidney function. It comes from the metabolism of creatine in skeletal muscle and from dietary meat. It is produced at a constant rate by the body, is freely filtered and reabsorbed by the renal tubules but about 10-40% of it is 'secreted' into the tubule which skews the GFR estimation done by the lab. Creatinine comes from the breakdown of creatine in your muscle. It is produced by the body at a constant rate and eliminated through urine. This makes it a good a marker to assess your kidney function. The higher the blood creatinine, the worse the kidney function. A blood test will tell you both numbers. Remember: GFR is only an estimate..it’s not an exact number! GFR is even more inaccurate in extremes of body habitus such as in obese or malnourished people, pregnant women, and amputees. High muscle mass: Athletic gains, muscle injury (rhabdomyolysis) causes a release of creatine phoshate from the muscle. 2. Heavy Meat Diet. 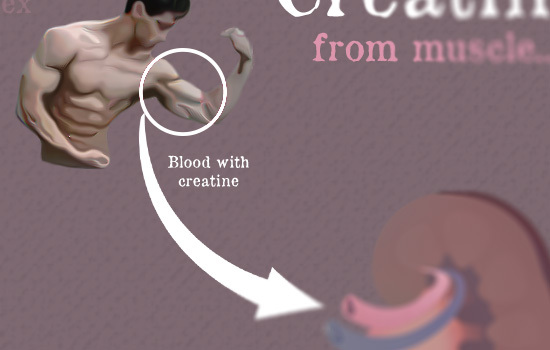 Creatine from animal meat is converted to creatinine in your body. The conversion can also occur during cooking.